Japan will end its refuelling mission in support of the US-led military operation in Afghanistan, Defence Minister Toshimi Kitazawa has said. Mr Kitazawa said the mission would end "based on the law" when its current legal mandate expires in January. But he suggested Japan could continue to provide support for the mission in an alternative form. Japan's government won August elections on pledges to pursue a foreign policy with greater independence from the US. 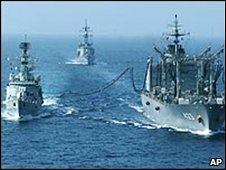 The eight-year-old Afghan support mission - which provides fuel and logistical support for US forces in the Indian ocean - has long been contentious. Some critics say Japan's involvement in the mission violates the nation's pacifist constitution, which strictly limits its military activities. Mr Kitazawa's statement came after Foreign Minister Katsuya Okada told reporters in Islamabad on Monday that it would be "difficult" to extend the mission. Japan had "no plans" to propose an extension to the mission in the Japanese parliament, Mr Kitazawa said. 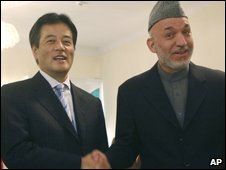 It is the clearest indication so far that the new government will end the mission in its current form, though correspondents say Japan's overall commitment to the US-led Afghan operation remains unclear. The government has suggested it could provide alternative support to civilian operations in Afghanistan - a possibility also mooted by Washington's ambassador to Japan earlier this month, reported Reuters news agency. Chief Cabinet Secretary Hirofumi Hirano was quoted by Kyodo news agency as saying that ministers were still arriving at their "final political decision" on what was best for the region. He said the government was keen to formulate "some concrete, comprehensive idea" by the time US President Barack Obama visits Japan in a month's time.